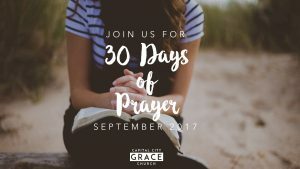 On Friday, September First, we kicked off our 30 Days of Prayer. This prayer emphasis is to thank and praise God each day through prayer as well as pray Capital City Grace would be used by God to see people come to know Him, and praying for our country and our world. Each day will start with a verse about praising God or giving Him thanks, followed by that day’s prayer. We’ll post each day’s prayer on our Facebook and Instagram account. I hope you’ll pray along and let’s see what God will do when His people pray! DAY 1 PRAYER – “ I will praise the name of God with a song; I will magnify him with thanksgiving.” (Psalm 69:30) Pray for the one person in your life who does not yet know Christ. That you would have the courage to share the gospel when the opportunity arises. Commit to regularly praying for this one person daily. DAY 2 PRAYER – “Let us come into his presence with thanksgiving; let us make a joyful noise to him with songs of praise!” (Psalm 95:2) For the church as we gather people to our worship service and other church gatherings. Pray God would use our ministries (Worship Service, Small Groups, and other connecting times) to reach people and that everyone would feel welcome. DAY 3 PRAYER – “I thank you that you have answered me and have become my salvation.” (Psalm 118:21) For our Small Groups to do life together, live in faith everyday, and live out the truth of the gospel. DAY 4 PRAYER – “Who is like you among the gods, O Lord – glorious in holiness, awesome in splendor, performing great wonders?” – (Exodus 15:11) Church Leaders: For our pastors, and for the Core Team to have the vision and wisdom to oversee our church family to live on mission for the gospel. DAY 5 PRAYER – “But seek first the kingdom of God and his righteousness, and all these things will be added to you. Therefore do not be anxious about tomorrow, for tomorrow will be anxious for itself. Sufficient for the day is its own trouble.” (Matthew 6:33, 34) If you are anxious about anything, tell God what you are worried about. What can you praise God for today? DAY 6 PRAYER – “Praise the Lord! Salvation and glory and power belong to our God. Praise the Lord! For the Lord our God, the Almighty, reigns.” (Rev. 19:1, 6) For the leaders of our country, for the leaders of our State, and the leaders of Columbus. DAY 7 PRAYER – “I will exalt you, my God and King, and praise your name forever and ever. I will praise you every day; yes, I will praise you forever. Great is the Lord!” (Psalm 145: 1-3) For our missionary, Larry DeArmey, as he is headed to south Florida in September to train leaders in Haitian churches and Bible schools. Pray also as he will be retiring from missions after this trip and visiting supporting churches in the fall. DAY 8 PRAYER – “Enter his gates with thanksgiving and his courts with praise; give thanks to him and praise his name.” (Psalm 100:4) For provision of all the financial and material resources that the church needs to be an effective light in our city. Pray we would not worry about finances, but stay focused on Jesus’ mission of reaching people. DAY 9 PRAYER – “Praise the Lord, O my soul; all my inmost being, praise his holy name. Praise the Lord oh my soul, and forget not his benefits.” (Psalm 103:1-2) That we daily spend time with the Lord and His Word, growing in our knowledge of Him in order to apply it daily in our lives. DAY 11 PRAYER – “….let us be thankful, and so worship God acceptably with reverence and awe, for our God is a consuming fire.” (Hebrews 12:28) That our church will effectively train and disciple every adult who desires to grow in Christ. That everyone in our church has an opportunity to serve using their gifts. DAY 12 PRAYER – “Give thanks to the Lord, call on his name; make known among the nations what he has done.” (I Chronicles 16:8) That we will know we are deeply loved and highly valued by God, not because of what we do but because of all Christ has done for us. DAY 13 PRAYER – “Sing to him, sing praise to him; tell of all his wonderful acts.” (I Chronicles 16:9) For Children’s Ministry teachers and helpers to lead with passion for Jesus, and the children would experience the love of Christ through them. For the children of Capital City Grace to grow in their relationship with Jesus, or to place first time faith in Christ. DAY 14 PRAYER – “For great is the Lord and most worthy of praise; he is to be feared above all gods.” (I Chronicles 16:25) Church planting is still the most effective way to reach people. Pray Capital City Grace would one day plant a church in Columbus. Pray God calls people from within our church, or partners from outside of our church to make this happen. DAY 15 PRAYER – “Give thanks to the Lord, for he is good; his love endures forever.” (I Chronicles 16:34) Pray for our Sunday worship service as visitors come this fall. Pray new people get connected to our church family. And pray for those serving on Sundays that they would rely on God’s strength. Pray for all who come to worship God and experience His community today. DAY 16 PRAYER – “I will extol the Lord at all times; his praise will always be on my lips.” (Psalm 34:1) Serving Our City: Ask God to help you notice any needs in our city. Ask Him how we as a church can serve to help meet those needs. DAY 17 PRAYER – “Through Jesus, therefore, let us continually offer to God a sacrifice of praise – the fruit of lips that confess his name.” (Hebrews 13:15) For churches in your neighborhood. Pray they would grow with people coming to know Jesus, and these churches would continue to be a bright light in the city. Pray God’s blessing on them. DAY 18 PRAYER – “…give thanks in all circumstances, for this is God’s will for you in Christ Jesus.” (I Thessalonians 5:18) That more leaders within the church would emerge, realizing the call and capacity that God has given them for His kingdom. DAY 19 PRAYER – “Thanks be to God for his indescribable gift.” (2 Corinthians 9:15) For our Small Group Leaders (Vicki, Tony, Paul & Shyla, Eric) to raise up biblical disciples in relational environments, helping them take next steps in their growth and maturity in Christ. DAY 20 PRAYER – “Let them give thanks to the Lord for his unfailing love and his wonderful deeds for men, for he satisfies the thirsty and fills the hungry with good things.” (Psalm 107:8-9) That our church would continue to be a bright light as we worship at Hyatt Place Hotel. That we would continue to be loving and servant-hearted towards the staff and hotel guests we see on Sundays. DAY 21 PRAYER – “Be still, and know that I am God. I will be exalted among the nations, I will be exalted in the earth!” (Psalm 46:10) Be still. Ask Jesus what you should pray for – listen to Him. DAY 22 PRAYER – “Give thanks to the Lord, for he is good. His love endures forever.” (Psalm 136:1) That our Worship Service would continue to reach people and always be a place for people in our city to connect with God and others. DAY 23 PRAYER – “Praise the Lord, O my soul. I will praise the Lord all my life; I will sing praise to my God as long as I live.” (Psalm 146:1:2) Pray for the needs of those in the church family. If you don’t know of any needs, contact a church friend today and ask them how you can pray for them. DAY 24 PRAYER – “And whatever you do, whether in word or deed, do it all in the name of the Lord Jesus, giving thanks to God the Father through him.” (Colossians 3:17) For the global Church, our fellow believers around the world, that they would stand firm under affliction and to look forward to eternal glory. DAY 25 PRAYER – “It is good to praise the Lord and make music to your name, O Most High, to proclaim your love in the morning and your faithfulness at night.” (Psalm 92:1-2) Pray for our missionary, Amy Paragon with Women of Grace USA. Pray she would be open to the Spirit’s guidance and focused on magnifying God through this ministry as she performs both roles of Women’s Leadership Studies coordinator and facilitator. DAY 26 PRAYER – “Praise the Lord! For he has heard my cry for mercy. The Lord is my strength and shield. I trust him with all my heart. He helps me, and my heart is filled with joy, I burst out in songs of thanksgiving.” (Psalm 28:6-7) Ask the Spirit to search your heart and reveal any areas of unconfessed sin. Acknowledge these to the Lord and thank Him for His forgiveness. DAY 27 PRAYER – “Father, thank you for hearing me. You always hear me.” (John 11:41-42) For Capital City Grace’s mission: to see all people pursue Christ. We would continue to have a spirit of unity around our mission, and protection from division. DAY 28 PRAYER – “I thank you for answering my prayer and giving me victory!” (Psalm 118:21) For the one person in your life who does not yet know Christ. That you would have the courage to share the gospel when the opportunity arises. Commit to regularly praying for this one person daily. DAY 29 PRAYER – “Praise be to the God and Father of our Lord Jesus Christ, who has blessed us in the heavenly realms with every spiritual blessing in Christ.” (Ephesians 1:3) That God would specifically raise up more volunteers to serve in every area in our worship service. DAY 30 PRAYER – “Let everything that has breath praise the Lord. Praise the Lord.” (Psalm150:6) Pause to thank God for one of His characteristics (love, grace, mercy, goodness, etc.). Express your thoughts of praise and worship to Him.